* Dial in your Suspension and Set your Pinion Angle Now available from UPR is their complete Mustang Rear Adjustable Control Arm Package for your 2011-2014 Ford Mustang GT and GT500! The ultimate package for anyone wanting to upgrade from the stock rubber bushings that want to put the power to the ground as well as dial in your pinion angle. Quality Construction: All kit components are made from the highest quality materials and finishes to ensure great performance on and off the track. No one gives you the bold clean styling of our Aftermarket Dress Ups, Suspension and Performance Parts for your American Muscle Car like UPR Products! 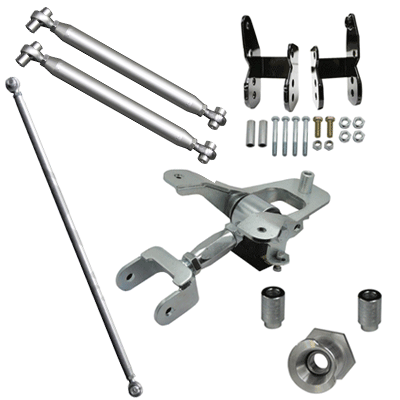 Includes Double Adjustable Upper Control Arm Kit, Double Adjustable Lower Control Arm Kit, Lower Control Arm Relocation Brackets and Double Adjustable Panhard Bar. No one else gives you the bold clean styling of our Aftermarket Dress Ups, Suspension and Performance Parts for your American Muscle Car like UPR Products! Installs in 2 hours or less. Includes all required hardware. Fits these Vehicles: 2011 2012 2013 2014 5.0L GT Coyote GT500 Mustang Shelby Roush & Saleen Vehicles.